Michael Anderson and Evan Barratt scored in a span of 4:32 of the third period to help give the United States a 2-1 victory against Slovakia in Group B competition at the 2019 IIHF World Junior Championship at Save-On-Foods Memorial Centre on Wednesday. Goalie Kyle Keyser (Boston Bruins) made 13 saves, including a penalty-shot attempt by Adam Liska 13:15 into the third to help U.S. maintain the lead. Anderson (Los Angeles Kings), a defenseman, scored a power-play goal 1:10 into the third for a 1-1 tie. Barratt (Chicago Blackhawks) scored off his backhand at 5:42 for a 2-1 lead. Defenseman Marek Korencik gave Slovakia a 1-0 lead in the second period when he scored off a snap shot from the left circle at 17:17. Slovakia goalie Samuel Hlavaj, a B- rated goalie in NHL Central Scouting’s Players to Watch for the 2019 NHL Draft list, made 32 saves. Forward Jason Robertson (Dallas Stars) was denied on a penalty shot by Hlavaj 12:29 into the second to keep the game 0-0. The victory by the United States against Slovakia was its 13th in 18 tries, including one tie, in WJC competition. The United States will next play against Kazakhstan in preliminary-round action Friday. Max Comtois (Anaheim Ducks) scored four goals and Morgan Frost (Philadelphia Flyers) had three goals and two assists to help Canada open the 2019 IIHF World Junior Championship with a 14-0 win against Denmark in Group A play at Rogers Arena in Vancouver on Wednesday. Owen Tippett (Florida Panthers) and undrafted 19-year-old Brett Leason each scored twice, and Jack Studnicka (Boston Bruins), Jaret Anderson-Dolan (Los Angeles Kings) and MacKenzie Entwhistle (Chicago Blackhawks) had a goal each and Cody Glass (Vegas Golden Knights) had four assists. Comtois, Canada’s captain, had seven points (two goals, five assists) in 10 games with Anaheim to start the 2018-19 season. He is the fifth player for Canada to score four goals in one World Junior Championship game, joining Taylor Raddysh (2017), Brayden Schenn (2011), Simon Gagne (1999) & Mario Lemieux (1983). Frost was named player of the game for Canada and his name was chanted by the crowd as he received the award. “That was coolest moment I have ever been a part of and I had chills running right through my body,” Frost said. Michael DiPietro (Vancouver Canucks) made 14 saves, had an assist and stopped Danish forward Phillip Schultz, who is eligible for the 2019 NHL Draft, on a penalty shot in the third period. Mads Sogaard, a 6-foot-7, B-rated goaltender on NHL Central Scouting’s players to watch list for the 2019 draft, stopped 30 of 41 shots before leaving with a left leg injury with 7:27 left in the third period. Undrafted 19-year-old William Rorth made one save in relief. Canada pays Switzerland on Thursday. Defenseman Erik Brannstrom, a first-round pick (No. 15) in the 2017 NHL Draft by the Vegas Golden Knights, scored two power-play goals to help lead Sweden to a 2-1 win against Finland in Group B action at Save-On-Foods Memorial Centre in Victoria on Wednesday. The win gives Sweden 45 straight victories in preliminary-round action at the World Junior Championship. The last defeat was Dec. 31, 2006, 3-2 in overtime against the United States. Defenseman Adam Boqvist (Chicago Blackhawks) had two assists for Sweden. Aarne Talvitie (New Jersey Devils) scored for Finland, which took seven penalties in the game. Brannstrom scored his first power-play goal off a shot from the point at 13:14 of the first period to give Sweden a 1-0 lead. His second came off a one-timer from the left circle on a 5-on-3 advantage 3:55 into the second for a 2-0 lead. Talvitie scored a power-play goal 16:26 into the third off a pass from Kaapo Kakko, an A-rated skater in NHL Central Scouting’s Players to Watch list for the 2019 NHL Draft, to make it 2-1. Sweden plays Slovakia on Thursday & Finland will play Kazakhstan on Thursday Also. Defenseman David Kvasnicka scored 52 seconds into overtime and Lukas Dostal (Anaheim Ducks) made 26 saves to help the Czech Republic to a 2-1 win against Switzerland to open Group A play at the 2019 IIHF World Junior Championship at Rogers Arena in Vancouver. Martin Kaut (Colorado Avalanche) had a goal and an assist for the Czech Republic, outshot Switzerland 9-1 to start the game. Kvasnicka, undrafted, beat Swiss goalie Luca Hollenstein with a high screened shot from above the right face-off circle shortly after Kaut hit the post. 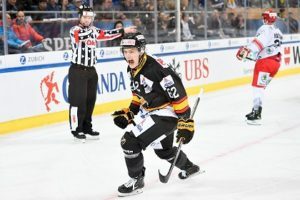 Nando Eggenberger, a 19-year-old C-rated skater on NHL Central Scouting’s November players to watch list for the 2019 NHL Draft, put Switzerland ahead 1-0 with a power-play goal at 7:45 of the second period. Kaut tied it 1-1 at 9:02 with a one-timer of a pass from below the net by Martin Necas (Carolina Hurricanes). Kaut, 19, has 12 points (five goals, seven assists) in 26 games with Colorado in the American Hockey League. Hollenstein, who is eligible for the 2019 draft, made 25 saves for Switzerland. At first glance, Saturday night’s hockey game was like any of the thousands of others taking place across Canada. 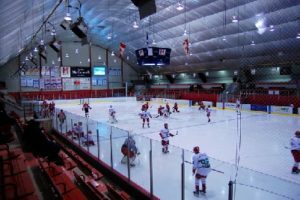 But as the starting rosters were read out over the arena’s sound system – and fans wove red and white flags, emblazoned with a green cedar tree, enthusiastically in the stands – it was clear that something else was taking place. 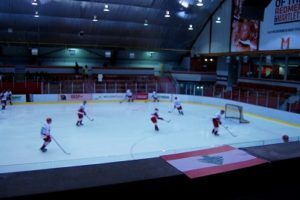 The game was a chance to showcase Lebanese hockey talent – and give the close-knit community in Montreal something to cheer for. Charles El-Mir, president of the Lebanese Ice Hockey Federation, said between 50 and 60 players – all of Lebanese descent, between ages 18 and 38 – currently play on the team. They hail from across North America, but the majority are based in Canada, “the hub of ice hockey”, El-Mir said. Last month, the Lebanese Ministry of Youth and Sport gave the federation official accredited status in Lebanon, making it the only official body representing Lebanese ice hockey players in the world. That status also paves the way for the federation to apply to join the Lebanese Olympic Committee and the International Ice Hockey Federation, which would open the door to international matches, including at the Olympics. The president of the Lebanese Olympic Committee, Jean Hammam, did the ceremonial puck drop at the start of the game in Montreal on 22 December, which saw the Lebanese side win 11-6 against a local team. Ralph Melki, the team’s coach, moved to Canada from Lebanon at age six. He started to play hockey two years later, after he asked his father – by that time, a fan of the Montreal Canadiens, the city’s National Hockey League team – to sign him up. “I grew up here and fell in love with the game,” Melki told Middle East Eye ahead of Saturday’s game. When he moved onto coaching after his playing days ended in his later teenage years, Melki said he noticed the high number of talented players of Lebanese background in Montreal. Melki said some of the players come from as far away as the US states of Ohio and Michigan, or the cities of Calgary and Edmonton in western Canada, to represent Lebanon. For El-Mir, the next major goal is to build an ice rink in Lebanon and begin training more players there. But until then, the base remains in Montreal. “We say … that we are writing history, to be honest with you,” he told Middle East Eye. This month also marked the first time the Lebanese Ice Hockey Federation helped get a women’s team on the ice. Ranging in age from 15 to 38, the players came to Montreal from across North America to play an exhibition match of their own on 22 December. “It’s surreal,” said Sally Tabarah, the women’s team’s manager, who hails from New Jersey. She told Middle East Eye she said she spent four months scanning the rosters of university teams and others, searching for last names that hinted at Lebanese ancestry. “We want to make it to the Olympics one day. It’s a lofty goal – but why not?” she said. The women had never played together before, but they bonded almost immediately, Tabarah said, revelling in their shared backgrounds and dreams of representing Lebanon. Canada coach Tim Hunter is looking for one attribute more than any other as his team prepares for the 2019 IIHF World Junior Championship. And it’s not just skating speed. Hunter wants his team to play fast and think fast. he 2019 WJC begins Wednesday and runs through Jan. 5, with games at Save-On-Foods Memorial Centre in Victoria, British Columbia, and Rogers Centre in Vancouver. Canada, the defending champion, is in Group A along with Czech Republic, Denmark, Russia and Switzerland, and will play its preliminary-round games in Vancouver. Outlook: The defending champions will have one player returning from last year’s team, Anaheim Ducks forward prospect Max Comtois, but remain one of the tournament favorites. Canada’s size and skill at forward could be its strength, led by a projected first line of Comtois (6-foot-2, 207 pounds), Vegas Golden Knights prospect Cody Glass (6-2, 178) and Florida Panthers prospect Owen Tippett (6-1, 216). One player to watch is high-scoring forward Alexis Lafreniere, who will become the seventh 17-year-old to play for Canada at the WJC (Connor McDavid, Sidney Crosby, Jason Spezza, Jay Bouwmeester, Eric Lindros). He’s projected as the No. 1 pick of the 2020 NHL Draft. Canada’s chances of success could hinge on the play of Michael DiPietro (Vancouver Canucks), the favorite to start in goal after Carter Hart (Philadelphia Flyers) backstopped runs to the championship game the previous two tournaments. Outlook: Russia will have two players back from the team that finished fifth at the 2018 WJC, ending its run of seven straight tournaments with a medal. Forward Klim Kostin (St. Louis Blues) and defenseman Dmitri Samorukov (Edmonton Oilers) are back and each has North American experience. Samorukov is in his third season with Guelph of the Ontario Hockey League, and also played five games with Bakersfield, the Oilers’ American Hockey League affiliate, last season. Kostin has 11 points (five goals, six assists) in 28 games in his second season with San Antonio of the AHL. Russia’s most intriguing player could be Podkolzin (6-1, 190), an A-rated player for the 2019 draft. He helped Russia finish second at the 2018 World Junior A Challenge, which ended Dec. 16, and tied for the tournament scoring lead with eight points (three goals, five assists) in six games. Russia always is well-coached and aiming to return to the medal stand. Outlook: Martin Necas (Carolina Hurricanes), who tied for the tournament scoring lead with 11 points (three goals, eight assists) and led Czech Republic to a surprising fourth-place finish at the 2018 WJC, will be back to help the Czechs try to win a medal for the first time since finishing third in 2005. Necas has two points (one goal, one assist) in seven games with the Hurricanes this season, and has 22 points (seven goals, 15 assists) in 26 games with Charlotte of the AHL. Also returning from last year is forward Filip Zadina (Detroit Red Wings) who tied for second at the tournament with seven goals. Goalie Jakub Skarek (New York Islanders) had an .848 save percentage in five games at the 2018 WJC and could start the tournament as the No. 1, but Lukas Dostal (Anaheim Ducks) could push him for time. Outlook: Switzerland is hoping experience makes up for a lack of top-end talent, with 13 players from the 2018 WJC returning. Among them is goalie Akira Schmid (New Jersey Devils), who was the third goalie at the 2018 WJC and has a 2.73 GAA and .905 save percentage in 11 games with Omaha of the United States Hockey League this season. Defenseman Tobias Geisser (6-4, 201), a Washington Capitals prospect playing with Hershey in the AHL, will anchor the defense. Forwards Phillip Kurashev (Chicago Blackhawks) and Valentin Nussbaumer, a B-rated prospect for the 2019 draft playing with Shawinigan in the Quebec Major Junior Hockey League, could be the leaders up front. It’s been more than 20 years since Switzerland won its only WJC medal, a bronze in 1998; the goal for this year is to beat Denmark and avoid the relegation round. Outlook: Denmark remained in the top division of the WJC after defeating Belarus in two games in the best-of-3 relegation round in 2018, and will be hard-pressed to avoid going through that again. Much of the responsibility for avoiding relegation could fall on Sogaard, the third goalie on the 2018 team who is a B-rated prospect for the 2019 draft. He has a 2.39 GAA and .931 save percentage in 19 WHL games with Medicine Hat. Also returning is forward Jonas Rondbjerg (Golden Knights), who led Denmark with seven points (two goals, five assists) in six games. Denmark reached the quarterfinals at the 2017 WJC, but with Canada, Russia and Czech Republic looking strong, their best bet for tournament success will be a win in the preliminary round against Switzerland. Many anticipate Jack Hughes of the United States being the most-watched player at the 2019 IIHF World Junior Championship. 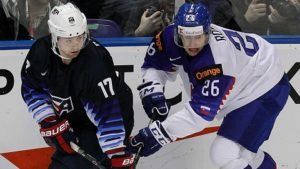 “Jack is a special player wherever he plays, on any team,” U.S. general manager John Vanbiesbrouck said about the 17-year-old center who is projected to be the No. 1 pick in the 2019 NHL Draft. “The uniqueness is he’s a young player and now a potential first-overall pick and we don’t want to be bashful about it or shrug the story off, but we have to manage it, and manage him. The 2019 WJC begins Wednesday and runs through Jan. 5 at Save-On-Foods Memorial Centre in Victoria, British Columbia, and Rogers Centre in Vancouver. The Group B bracket includes Finland, Kazakhstan, Slovakia, Sweden and the United States. The last time the WJC was held in Canada was 2017 and the United States defeated the host country 5-4 in a shootout to win the gold medal at Bell Centre in Montreal. Only three countries have won the WJC on home ice: Canada (1991, 1995, 2006, 2009, 2015), Finland (1998, 2016) and the Soviet Union (1983). Outlook: The United States is looking to win a fourth straight medal after winning gold in 2017 and bronze in 2016 and 2018. In addition to being fast and creative on offense, and strong on defense, the United States also has depth at the goalie position with Cayden Primeau (Montreal Canadiens), Kyle Keyser (Boston Bruins) and Knight (2019 NHL Draft-eligible), who received an A rating in NHL Central Scouting’s Players to Watch list in November. There are five returning players: defensemen Quinn Hughes (Vancouver Canucks), Dylan Samberg (Winnipeg Jets) and Michael Anderson (Los Angeles Kings); and forwards Josh Norris (Ottawa Senators) and Ryan Poehling (Montreal Canadiens). Outlook: Sweden ended a three-year medal drought when it earned silver last year, falling to Canada 3-1 in the gold-medal game. Sweden will have a different look this year but will still be a hard-working, fast-skating team with quick transitions that plays to the inside. It has a solid nucleus, particularly with defensemen Rasmus Sandin (Toronto Maple Leafs), Nils Lundkvist (New York Rangers), Erik Brannstrom (Vegas Golden Knights) and Adam Boqvist (Chicago Blackhawks). Defenseman Timothy Liljegren (Toronto Maple Leafs) is out because of an injury so Broberg, an A rated skater in NHL Central Scouting’s Players to Watch list, may play a significant role. Outlook: Since winning a gold medal in 2016, Finland has finished ninth (2017) and sixth (2018). One area that has proven troublesome is goal scoring, as Finland placed last in the 10-team field with a 5.31 shooting percentage (12 goals on 226 shots) in 2017, and ninth in shooting percentage (8.57) in five games in 2018. 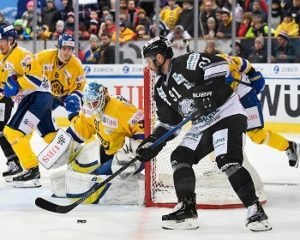 Finland hopes to resolve that issue with some high-energy performers on this year’s roster, including forwards Rasmus Kupari (Los Angeles Kings), Aleksi Heponiemi (Florida Panthers), Sampo Ranta (Colorado Avalanche), Aarne Talvitie (New Jersey Devils) and Kakko, who is projected to go among the top five picks in the 2019 draft. Buffalo Sabres goalie prospect Ukko-Pekka Luukkonen could receive most of the starts. Defenseman Urho Vaakanainen (Boston Bruins), who has two assists for Providence of the American Hockey League in six games, will represent his country for a third straight time at the WJC. Outlook: One player to keep an eye on for Slovakia is defenseman Martin Fehervary (Washington Capitals). The 6-foot-2, 194-pound left-hand shot, who will represent the Slovakia National Junior Team a third straight year, has one goal and two assists in 23 games for HV71 in the Swedish Hockey League. Hlavaj (6-3, 187) of the Slovak Under-20 team is a B rated goalie on NHL Central Scouting’s Players to Watch list. Outlook: Kazakhstan is back in the top level at the WJC for the first time since 2009 after winning the Division I Group A tournament in December 2017. Kazakhstan returns many players from that championship group, including left wing Artur Gatiyatov, who was named the best forward of the tournament with seven points (four goals, three assists) in five games. Kazakhstan is the fifth nation in six years to get promoted from Division I, joining Norway (2013), Denmark (2014), Latvia (2016), and Belarus (2015, 2017). The “silent assassin”, the nickname for Miroslav Šatan, has symbolically bid farewell to his career. It ended with a unique exhibition match between two teams composed of the so-called “golden generation” players on December 18, starting at 18:00. One third lasted a symbolic 18 minutes. Czech goalkeeper Dominik Hašek opened the game, in which dozens of Šatan’s former teammates, with whom he represented Slovakia, appeared on the ice, like Ján Lašák, Ľubomír Višňovský, Peter Bondra, and Michal Handzuš. “For me, the representation was always the greatest motivation, and I preferred to play with a double cross on my chest,” said Šatan, as quoted by the TASR newswire. The Ondrej Nepela Ice Hockey Stadium was sold out during the game. The ticket price was a symbolic €18. “It was one of the few games I did not want to win, but where I wanted to have a a great time,” said Šatan after the match, as quoted by TASR. Šatan is the only player who earned all the three medals Slovakia managed to win during the Ice Hockey World Championship – Saint Petersburg (Silver, 2000), Goteburg (Gold, 2002) and Helsinki (Bronze, 2003). He scored altogether 81 goals on the Slovak representation team, Sme wrote. He won the Stanley Cup in 2009 when playing for Pittsburgh Penguins. During the match, Šatan received great honours, due to being entered in the Hall of Fame by the Slovak Ice Hockey Federation (SZĽH). The Slovenian players celebrate after getting their fifth win in the fifth game at the 2019 IIHF Ice Hockey U20 World Championship Division I Group B against Ukraine to earn promotion. Slovenia’s juniors are celebrating gold in 2019 IIHF Ice Hockey U20 World Championship Division I Group B, two years after the same group of players won the U18 Division IB. A 4-1 victory over Ukraine on Friday afternoon secured top spot for Ales Burnik’s team. Despite going behind midway through the second period, Slovenia rallied to claim a comfortable win thanks to goals from Aljaz Predan, Jaka Sturm, captain Jaka Sodja and Martin Bohinc. Defenceman Nejc Stojan collected three assists to finish with 2+5 for the tournament; Jan Drozg’s helper on Predan’s marker took him to 12 (4+8) points, finishing as the competition’s top scorer, five points clear of a clutch of players. Slovenia wrapped up top spot after the first game of the final day in Tychy, Poland, but the tournament was far from one-sided. Going into Friday’s play, there was a three-way battle for top spot and five of the six nations were in with at least a theoretical chance of a medal. In the event, the host’s 4-2 win over Hungary secured silver for Poland and left Hungary with bronze. Italy defeated winless Japan in overtime to take fourth place ahead of Ukraine. The Japanese drop to Division IIA for next season. Slovenian head coach Burnik said: “It was a very interesting tournament. The competition was high quality because all the teams were fairly evenly-matched. Even going into the last day we had three teams going for promotion and five hoping for a medal. The toughest battle for Slovenia came against Hungary. Down 1-4 after 40 minutes, a big fightback in the third period set up a shootout win that gave the Slovenes a crucial advantage going into the final day’s play. Captain Sodja had an assist as Rok Kapel made it 2-3 then scored the tying goal himself. Slovenia won all five games at the tournament but only three of them came in regulation time. “Every game was tough but I think Hungary was the hardest,” Sodja said. “We came from a 1-4 deficit, got through overtime and won in a shoot-out. I think we deserved our first place here. Promotion brings new challenges, not least because many key players will be unavailable to tackle Division IA next year. Absentees will include Sodja and the two North American-based forwards, Drozg (Shawinigan Cataractes) and Mark Strazisar (Hampton Roads Whalers). Slovenia’s success has a strong Jesenice accent, reflecting the status of Anze Kopitar’s hometown as the hockey hot spot of the country. 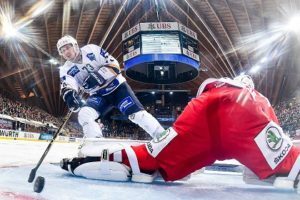 Ten of the roster play their hockey there, including Stojan, Sodja and goalie Ziga Kogovsek, and many of them have been getting extensive experience of the adult game in the cross-border Alps Hockey League. Head coach Burnik is also part of the staff at Jesenice and recently had a spell as interim head coach following the departure of Gaber Glavic last month. While most of the plaudits went to Slovenia, there were honorable mentions for two Hungarian forwards. Kristoff Papp’s six goals made him the leading goalscorer of the tournament, one ahead of Hunor Csaszar. Slovenia’s Drozg earned the prize for top forward, Poland’s Olaf Bizacki was named top D-man and Italy’s Davide Fadani was the leading goalie.